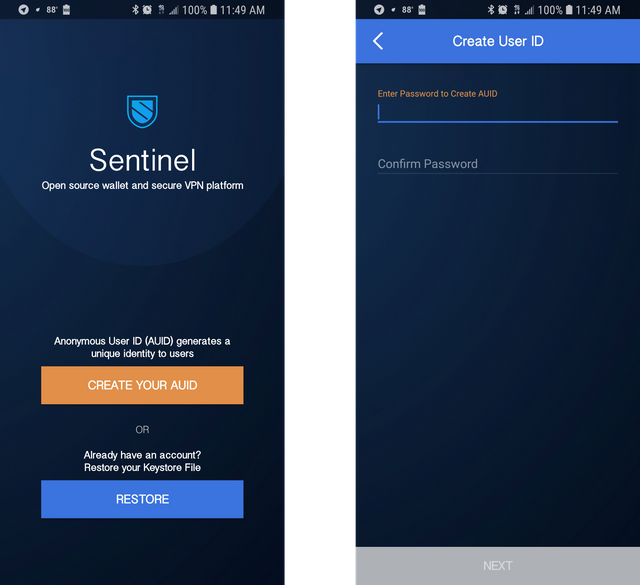 Sentinel Group is the company behind the Sentinel dVPN, a distributed, anonymous, decentralized VPN service that leverages the power of the blockchain to ensure 100% privacy. They make a great functional dVPN product that is available for a variety of platforms. In a previous article I posted on how to set up the app on a Mac. 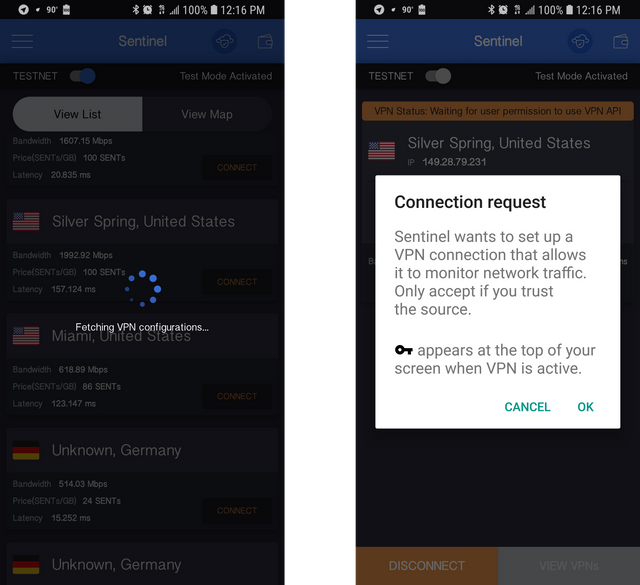 Sentinel has just released a beta version of their dVPN for Android, and it is very easy to set up and test. In the following series of screenshots, I’ll show you how to set it up on your own smartphone, receive 1000 TEST SENT tokens, and securely and anonymously connect to anywhere in the world. First, visit here on Telegram on your Android phone. It will run you through a basic introduction to their product (including Swixer), along with some basics on privacy and encryption, and you’ll eventually be presented with a link to download and install the latest version for Android. Once installed you’ll be presented with the choice of creating a new AUID or restoring. We will choose Create Your AUID, then give it a password. You will need this later, so write it down. 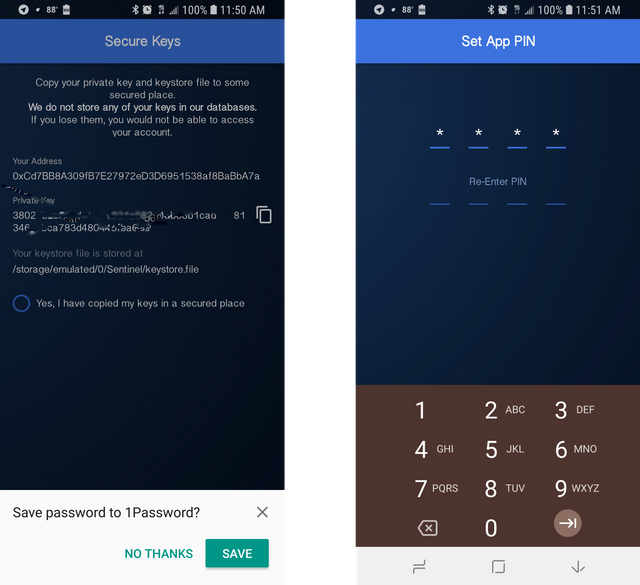 Next you’ll need to copy your secure keys (left) to a safe location, and set a PIN (right). FYI: this PIN is used to log in once you will use the app regularly. To check this, click on the wallet icon in the upper right. Eventually, you will see 1000 TEST SENT in your account. From here, we can go ahead and select a VPN to connect to. Here I chose “Silver Spring, Maryland” and am presented with a dialog box to make an initial payment of 100 TEST SENT (on left, below). Click “pay” and you’ll be presented with the screen on the right. Enter your password (not PIN) from earlier and click SEND. Click okay and you are good to go. Speed will be dependent upon how close you are to the source node. You will need you PIN from earlier to get back into the app with the VPN running. 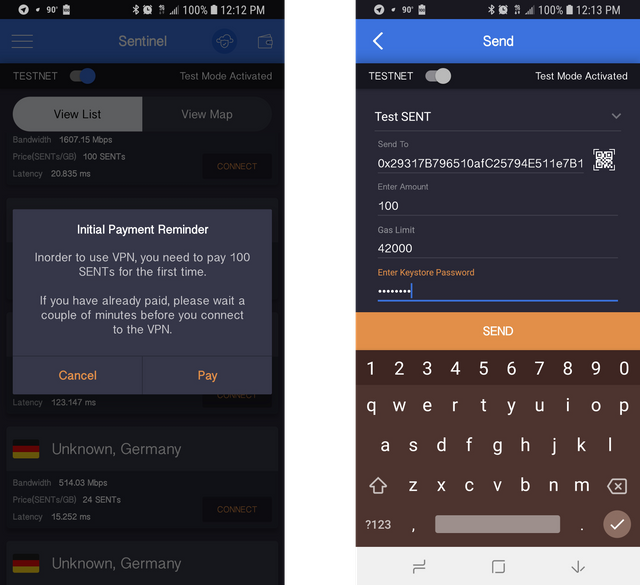 All in all, this is a great addition to Sentinel Groups’ robust, secure and decentralized VPN product. Future versions of this will include the Sentinel SWIXERswap mixer; the ability to swap ETH, PIVX or BNB for SENT tokens securely and completely anonymously. Feel free to contact me if I got anything wrong or if this needs any updating. Cheers! ✅ @drycounty, I gave you an upvote on your post!